GL-Turbo blower systems are rugged and require little maintenance. They also provide portability and can be quickly and safely moved around the site. These attributes are why our customers choose our blowers for demanding services, such as heap leaching. Our LS Multistage offer the highest pressure range of any other manufacturer. 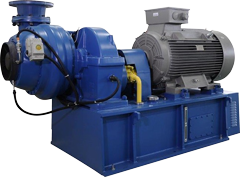 For higher pressure ratios we have our GL geared turbo blowers. Let our experience work for you on your next project.